The Palais des Festivals de Cannes will host a two-day tradeshow Heavent Meetings 2018, including the ceremony for the Heavent Awards 2018. 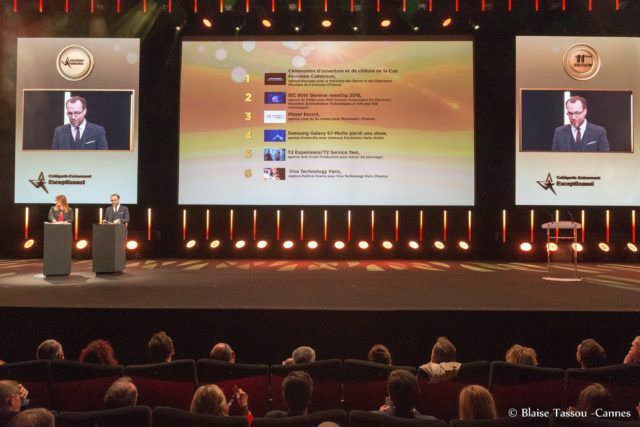 All live communication agencies worldwide can compete for the Heavent Awards 2018, taking place 29 March 2018 at the Palais des Festivals de Cannes, during the European tradeshow for MICE and events Heavent Meetings 28 & 29 March. The submission deadline is 5 February 2018. The Heavent Awards offer a great opportunity to remember communication agencies’ brilliant expertise and achievements and give the agency increased awareness in front of the corporate jury including L’Oreal, Nike, Coca Cola from France, Royal Dutch Shell from the Netherlands, Beiersdorf and Continental from Germany. The agencies can enter their best 2017 events to be recognized among the international event community, for the following eight categories: Event Award B2C, Event Award B2B, Internal communication Event Award, Exceptional Event Award, Sport, Cultural, Educational or Entertainment Event Award, Integrated or Multichannel Event Award, Brand experience Event Award and Forum, Summit, Congress, Fair Award. The Heavent Meetings trade fair provides venue/hotel managers and event service providers with a unique opportunity to meet major decision-makers and buyers through pre- scheduled meetings. Heavent Meetings invites 500 Top Decision-makers from France and Europe (Germany, UK, Switzerland, Belgium, Austria, etc.) based on a proven and successful formula.